NY Mag just did a lovely feature on our amazing Lisa B socks. They nailed it when they say these puppies are a best bet - they're comfy, cozy (a word I really can't get enough of when describing all I want to wear in the winter, as I'm sure you've noticed) and colorful. We've got polka dots, stripes and argyle style and above the knee and below the knee lengths. 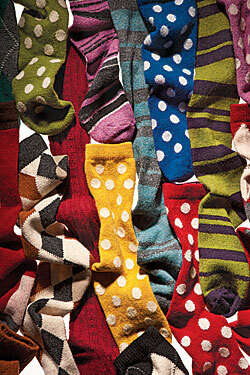 Pretty sure we've got a sock for everyone whatever your mood may be! I personally love to rock the above the knee polka dots with boots, tights and a cute dress. Wham bam thank you m'am.